Penzeys Spices, Memphis TN – Marie, Let's Eat! This is Marie, writing the entry about Penzeys because I am the cook in the family. Penzeys is the kind of place that could make any cook weak at the knees. 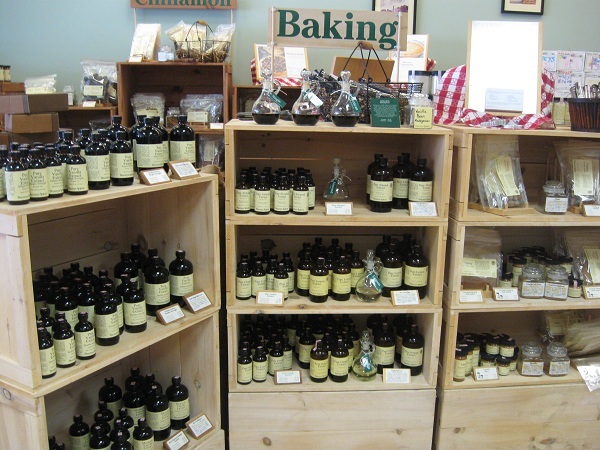 Imagine a room filled with wooden racks and shelves, the air scented with the smell of blended spices, and on every shelf and rack stands a glass jar containing a sample, which can be opened and sniffed and shaken. If you’ve ever stood in a store with a bottle or jar of something tempting in your hand and put it back because you didn’t want to risk $4 or $6 or $10 on something untried, this is the answer. The first time I visited one of their stores was on a whim, because a friend of my sister’s said she liked to eat their candied ginger as a snack, and it seemed like a good way to kill some time while on our way to somewhere else. When I went inside I almost got trapped by the cinnamon. I just couldn’t pull myself away without buying some to take back with me, and had to open my new jar in the car to get some more whiffs on the way, because it just made me so happy. They have four kinds, each distinctive and very individual. The Vietnamese is strongest, to the extent that you have to reduce the amount by a third in your recipes. I wound up getting the full array of baking and cooking spices that I usually use in holiday recipes. My family agreed that year’s holiday’s cooking, especially the spice cake, was hands down the best ever. This includes my mom, who usually makes the spice cake herself. After that year, I got to make it in her kitchen any time I wanted. Visiting the stores in person is several hundred percent better than ordering online, even if you live where the shipping cost is less than the price of gas to get there. The main reason is the sample jars, but their website is also not terribly convenient to use; for instance, it is easier to google the recipes listed on the site than to search for them, and it requires altogether too many clicks to put anything in your basket. Once past that quibble, however, their customer service is great, and they send something free to try out with most of the orders. If you don’t live in or within driving distance of one of the lucky cities that hosts a location so you can experiment a little, definitely place an order for some of your familiar basics. Also try one or two of the blends that look appealing. You really won’t want to use anyone else after you try Penzey’s. I’ll also note that even though it is technically true that you ought to change out your spices once a year, it’s definitely true that a 2-year-old bottle of their good quality stuff is as good or better than a fresh container of grocery store ordinary. If you still need to be sure before you order, get a free catalog. They come with coupons and recipes and some really lovely pictures of food. As a side topic, for anyone who needs to reduce salt in their diet, Penzeys is where you need to go to get back flavor in your life. They have a very large number of salt-free options, some of them just tasty in their own right and only coincidentally salt-free, and some specifically designed as something to turn to when you can’t use salt. My husband puts Mural of Flavor on everything that he doesn’t put pepper on instead, so the salt shaker is a very rare visitor to the dinner table, even though we are not on any salt restriction. 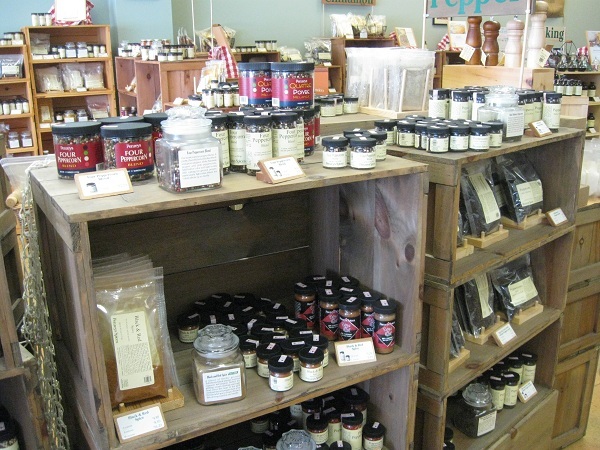 Penzeys spices were among the things I introduced to the family when I married my husband, acquired kids, and suddenly had the ability to cook big recipes without having to eat them myself for three or four days running. Grant says he can no longer eat bread without the Penzeys Sandwich Sprinkle blend. I cook nearly all my vegetables with one of the Italian, Adobo, or Singapore curry blends; the first time the kids fought over who was going to get the last helping of sauteed squash was sweet, sweet music. It is incredibly easy to make really flavorful and satisfying dinners even without a lot of variety in your diet, just with a handful of the blends and a little experimentation. A sprinkle of Singapore spice goes wonderfully with tomato soup, for instance, and also makes a divine chicken salad. Chicago Steak Seasoning should come with every grill sold, as a required basic tool for cooking out. The basics are very good, too. If you get some thyme, sage, and bay leaf it is sure to get used up every winter if you do any cooking at all. Posted on June 23, 2010 July 17, 2016 by Grant G.Posted in marie writes, memphis, tennesseeTagged marie writes, memphis, tennessee. Pingback: Wild Beet Salad Company, Germantown TN – Marie, Let's Eat!